I’ll start by sharing how I came to organize The Artist as Debtor platform (artanddebt.org) with Coco Fusco. I actually first met Coco while undergoing my own transformation into artist-debtor at Columbia University where she was a professor and I was getting an MFA. This is not to say that I regret the experience or feel cheated by it. However, it is remarkable to me how little I comprehended the intimate and long relationship with a financial institution I was entering into and how little this common reality was acknowledged among my peers at the time. I think most of us saw the loan as a good investment—letting our minds wander toward contemplating mechanisms of financial disempowerment were out of step with the gung-ho market-positive spirit of the early 2000s. Soon after graduating, I realized that the core political culture of the program (and probably many other MFA programs at the time) was basically Free Market Libertarianism. The assumed thinking was that we had all made an investment in our futures; the game was on, and it was natural to compete tooth and nail for success. We could not have foreseen the impending sweep of financial history, which would soon change the nature of the investment. In 2004, I graduated into a red hot art market, a year after graduation had a solo show in Chelsea and work for sale in art fairs internationally as did many of my peers. Young artists–especially those in the circles of Columbia, Yale, and UCLA seemed to be regularly selling out their shows (I wasn’t one of them). Some were instantly able to pay off school debts while others got sucked into expensive lifestyles. Even though in reality most of us were not making much money, the increasing private infrastructure of the art world (more art fairs, websites measuring market value, and the like) seemed somehow reassuring. It felt that we were entering into a growing economy, which would support a middle class life or better for a lot of people. Soon after having that thought, I watched the economy screech to a halt, at least for me, and almost everyone I knew. After just a pause, while the extent of the damage to Middle Class America was still revealing itself—even before people’s unemployment support had run out, the blue-chip art world steamed on ahead: the top of the art market began setting auction records (and still is today). As I watched painters and installation artists enjoy shorts stints of selling followed by dry periods of head scratching about how the rent was going to be paid, the notion of one big tent-art-market was quickly exposed as more or less a pyramid scheme. Up until the crash I really wanted to believe in an art market that was democratic and accessible; a mechanism of support for the creative life. What didn’t cross my mind was that this free-market aspiration was no longer optional after signing the loan agreement. My $70,000 of debt needed to believe in it. This platform is about looking at this basic relationship artists have to banks in the financialized era, and brainstorming how we are going to get out of it. The first step is pulling that ideology away from the eyes—a picture of market based success which deems everything else artistically uninteresting. Around 2009, after Obama’s cabinet choices meant that his hope and change campaign moment was exposed as status quo, and the wreckage of the economy and powerlessness against a 1% public resource grab was laid bare, I felt in my bones that a social contract had been broken at the highest level. Corruption-cases similar to those of Wall Street began to come to light and people began caring. The 2009 exhibition Skin Fruit was a Jeff Koons curated selection of Trustee and Greek mega-shipping magnate Dakis Jannou’s personal collection at the New Museum. Meanwhile, the worst-offending Hedge Fund managers like Steven Cohen were also busy cornering the art world markets, and I saw the art economy was not separate from derivative-era Capitalism in its conflicts of interest and speculative nature. The art economy was dominated by the very people involved in breaking the social contract nationally: the post-democracy billionaires who sit on museum boards and make up the collector class. I knew that this could culture not be confined to financial deals, that reified individuality, and assumed inequality was infecting the aesthetics, and social desires of the whole art world. This meant that my artistic aspirations could not then remain the same. Reflecting back on my graduate school education, I began to see that market positivism had infected pedagogy: discourse and aesthetic preferences had intermingled sloppily with projections of success in the market. Though Coco had us read radical French thinkers from the 1960’s, Ethical frameworks as might be applied in our times were never discussed. Class was never discussed. The unstated peak artistic aspiration, supposedly based on merit, was an ability to command high prices. The unstated ethics was that anything necessary to get there was valid. The crash short-circuited this way of thinking for me. As the damage from the foreclosure crisis gradually emerged, the picture of a country ravaged for decades by an elite power grab through deregulation, debt, rising tuitions and lower taxes and loopholes came to light. That the crisis fell disproportionately on the shoulders of black and poor communities long shut out of the American Dream helped wake up in me the value of social justice and solidarity which had been completely missing from my art education. This class solidarity made me highly skeptical of the position of artists in relation to collectors. An alliance with the 1% –a coupling of fates—started to seem like teaming up with the wrong side. Having dropped out of the gallery world, around 2010 I began to experiment with ways to challenge the ideological-financial context in public. Soon I was not alone in this wondering, but allied with a world-wide movement. I was heavily involved in Occupy Museums actions to highlight how financial inequality is structured into arts institutions. The actions such as uninvited assemblies outside and inside of MoMA, Lincoln Center, the Guggenheim, and the Metropolitan Museum of Art, were aimed at cutting through normative ideology where museums are considered benign houses of beauty and relevance. We wanted people to understand that as neoliberal institutions controlled by the wealthiest elites, museums have a role in disempowering artists and the public as they turn art into a new asset class whose value builds up and is harvested through public exposure. The Artist as Debtor platform is a continuation of this work. It’s about shedding light on a withering pressure on our private and public lives as artists and citizens. Debt is so much part of American life that we have learned not to see it and taught ourselves to detach it from its historical connections to slavery and indenture. When it does make the news, large numbers pop out and grab headlines—like the trillion dollar plus debt load now riding on the backs of students and past students. But numbers mystify the situation as much as help it, because part of the danger of debt is thinking about it abstractly. It’s important to understand what is really at stake within a culture of growing financial extraction. The debt crisis is about stolen time and conquered dreams on one hand, and the build up of an ultra-luxury culture on the other. For artists who work in an industry that is already precarious, the specter of a personal debt crisis, along with rising costs of urban living are impacting on the core values of the field. Not only does the lifelong yoke of debt pave the way to permanent social inequality, homogenoization of race and class, but also ends up guiding aesthetic and political decision-making in the minds of artists. If artists need to keep two or three jobs to afford treading water in New York, they likely don’t have time to get involved in political organizing. Knowing that a political turn in the work is not likely to ingratiate them with collectors, these paths are simply avoided. Debt erases political agency. Debt impacts visibility. Along with market success, minor celebrity status is a common goal of today’s artist. In a way contemporary art is more visible today than ever–for example, museums are getting good at drawing crowds with blockbuster shows and starchitect buildings situated in the new center of up and coming cities from Shanghai to Dubai to Dallas. Art has taken on a role as Globalism’s high-brow public relations. But along with visibility comes invisibility. Greg Sholette’s Book Dark Matter helped me to think structurally about the part of the art world that doesn’t make the news media, not often seen in galleries, not found in art history textbooks, museums, not invited to the party at all, but invisibly generates value—this is the Dark Matter, a group of which I am a member. It represents a huge mass of labor; the labor of art workers from artist assistants and installers to museum guards to adjunct professors which craft valuable objects and exhibitions, and give the arts relevance and the intellectual legitimacy. All of this labor is extracted from the bottom of the pyramid by the ecosystem of tiered art world institutions such galleries, art fairs, art centers, and auctions, and congeals at the top ultimately as financial assets which are programmed to bring in windfalls for the capitalized and connected. 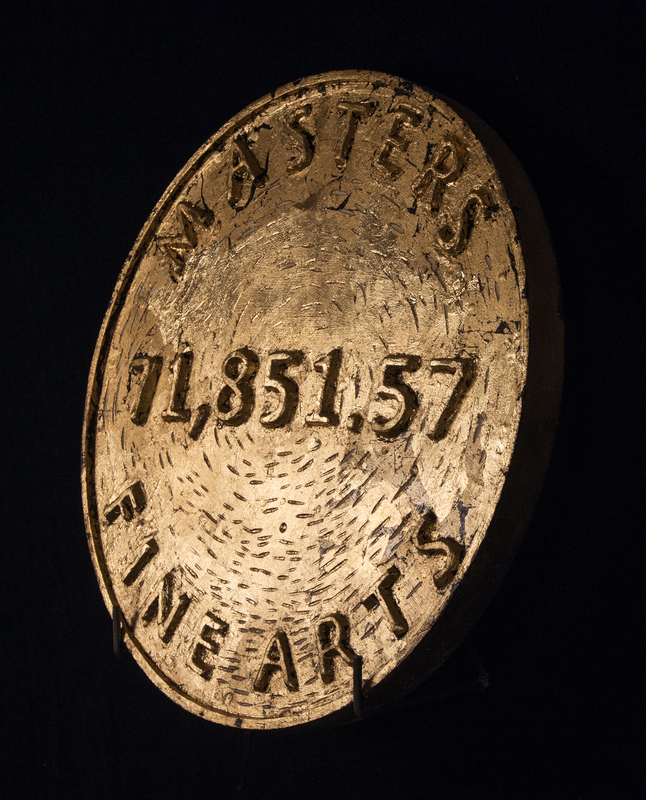 How does artist debt relate to Dark Matter? To the well capitalized, its another equivalent asset: stuff called SLABS which can be bundled repackaged and short-sold to the tune of big profits. However, the giant mass of art school debt is the darkest kind of dark matter because debt is future time, and it will therefore continue to keep people in the dark for years to come. It is enormously dangerous for the fragile future ecosystem of art. A major challenge in the conversation about debt is that personal debt is tied into shame. Debt looks exactly like failure in a culture which idolizes and even requires success. In my experience, its a taboo in the art world to talk frankly about economic reality, class, and debts. So this platform is about dissolving shame in the acid of clear thinking, and letting some fresh air in. It’s about supporting a growing struggle in the most powerful way. Sometimes it feels like turning one’s energy toward the debt crisis, racial justice or the fight for climate stability is just too big, just too depressing to talk about. We can wallow in this space of critical negativity and frame debt as narratives of victimhood which is maybe not so helpful. But there is something I find hopeful about debt: So many of us are in it. It seems at first to be about me and my own economic bad-decisions, as if my economic existence exists within a vacuum. But this debt was never really personal, our future money was immediately packaged into bundles by the banks when we signed the papers. And from our side, the fact that we are bound together by the same banks creates the best reason to embrace solidarity. Now what’s needed is to discover powerful tactics that will work the best in this age of the derivative. We need to reclaim our dignity from indenture. In my view, this road to empowerment also includes a new artistic direction in which we’ll need to reformulate aesthetics, authorship, institutions. I hope that this platform will be a place to deepen understanding about the relationship of debt to the arts, and to think aloud about what kind of art movements might arise when the shackles are thrown off. This essay has been published in partnership with The Artist as Debtor, artanddebt.org.